Wow, doesn't look good. There is a 1.3mb free area at top in 5d3, not useable? that should be useable, right. maybe resize the memory of one of the sections? Like take 1/2 away from the player? thats what i basically want to do. but i guess the most areas have their adresses hardcoded in the using code too. so i'd better check the dynamic memories. You may ask - why I'm still investigating this? The small allocators are sometimes too small for our needs, for example when loading too many modules, or when loading some memory-intensive ones. On small cameras like 1100D, you don't even need to do that. 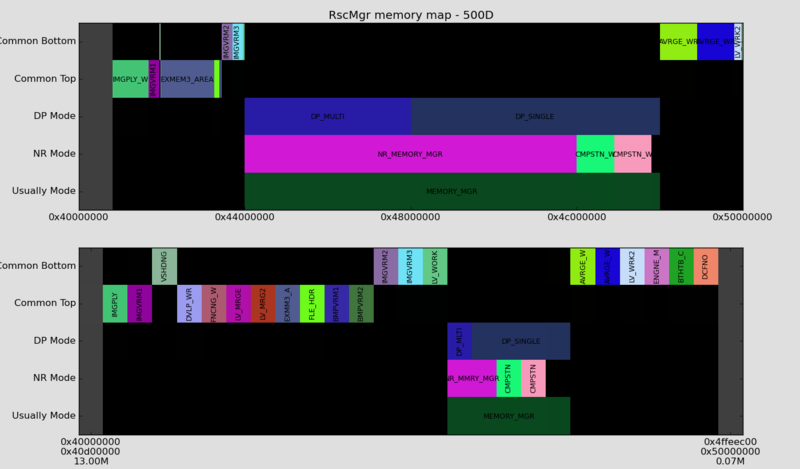 Okay, but we have two large allocators (shoot_malloc and SRM), right? - shoot_malloc: Canon code expects it to be completely free when doing certain things (for example, in-camera raw development, or enabling certain noise reduction modes, or - on 60D - simply switching between photo and movie mode). It works most of the time, but those rarely-used actions will fail (ERR70 or camera lockup). - you can't allocate too many blocks from there (about 1000 from shoot_malloc, or a very small number from SRM). 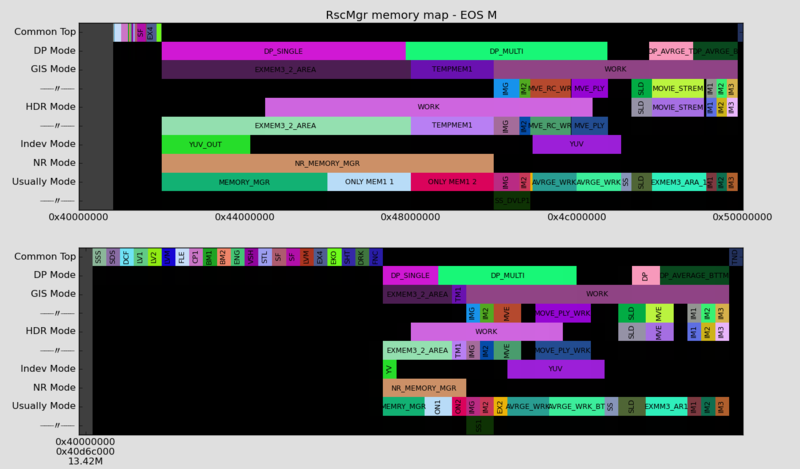 In particular, Lua is memory-intensive, allocating thousands of small blocks using realloc. 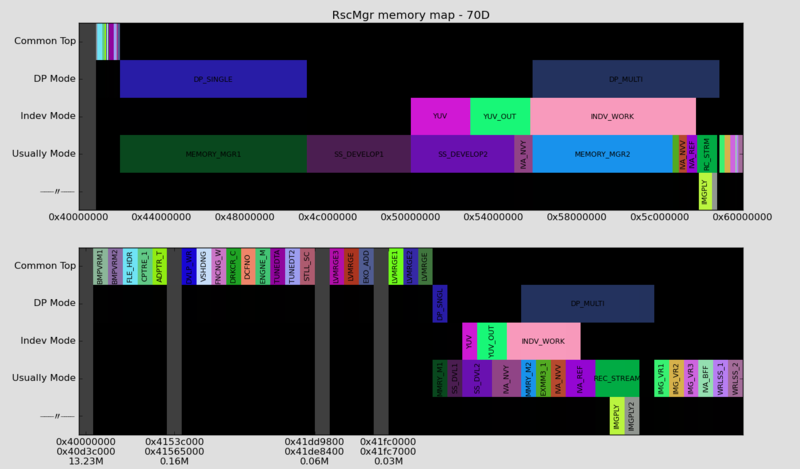 Our current allocators are not ready for that - loading many scripts gives ERR70, even if you have plenty of memory available, because of fragmentation. I managed to get better results here, by pre-allocating a fairly large block (512K) and managing it with a custom allocator optimized for small blocks. However, that large block may end up in shoot_malloc, which I prefer to avoid. Finally, some cameras still have memory that cannot be allocated by shoot+SRM. For example, 5D3 can allocate 438MB outside LiveView, but only 284MB in LiveView. I kinda doubt the LiveView actually uses 150MB. On 60D, the numbers are 436 outside LV, and 374 in LV - a little better. That extra memory could be useful for raw recording, but unfortunately it's not visible on these maps. 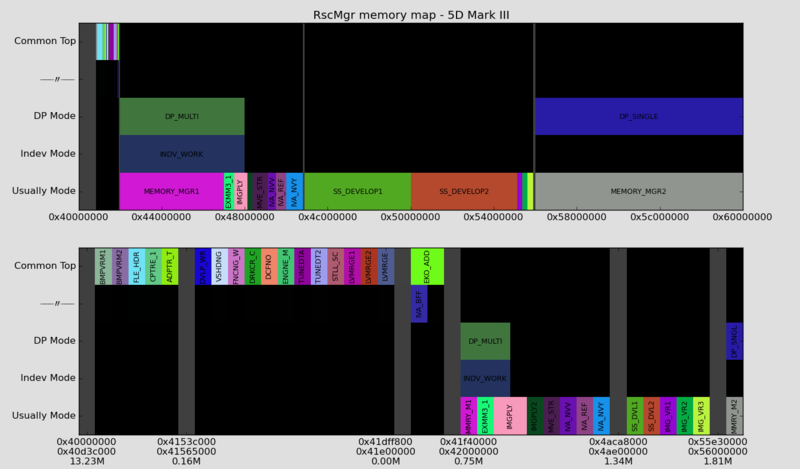 From the memory maps above, on 60D on the maps above, you can see a 7MB block at the end that appears unused (similar to the one g3gg0 found on 7D). 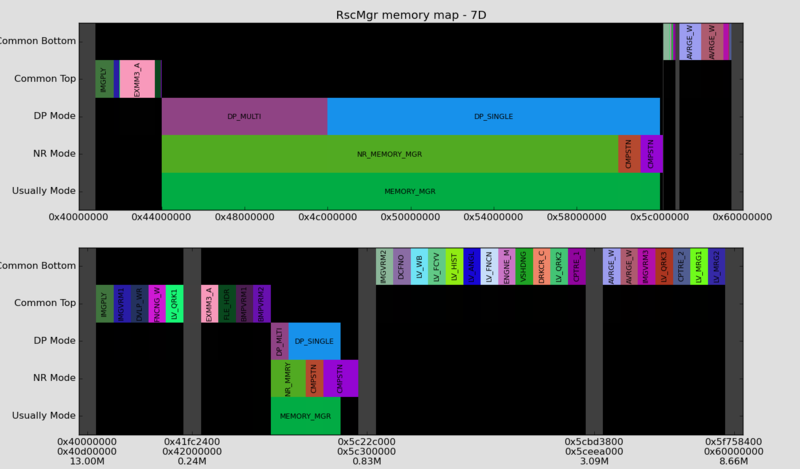 Currently, autoexec.bin is loaded there, but it has some side effects - you cannot run the dm-spy-experiments branch, and not all this memory is available for ML. 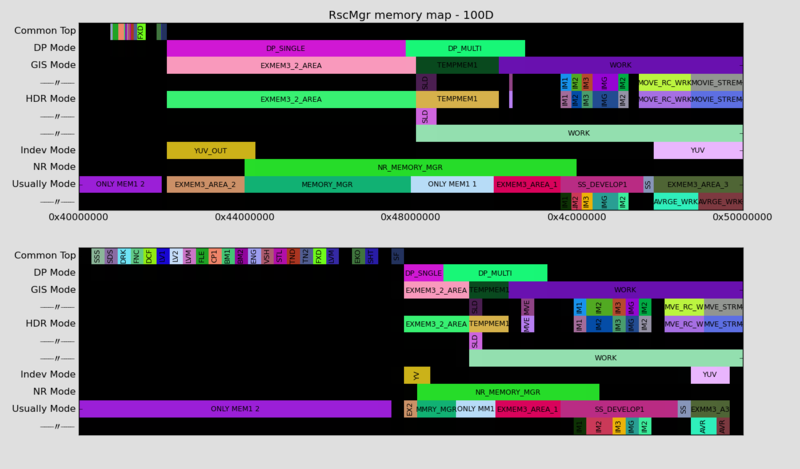 I'm thinking to move autoexec.bin to AllocateMemory, and use the 7MB block as general-purpose memory for ML, using some custom allocator (maybe Canon's). 50D: looks like we might have found a 10MB block. This camera has enough RAM for the current needs, so enabling it will not give obvious benefits - maybe only under very heavy workloads, with lots of Lua scripts loaded. Or maybe it could be used to buffer 2 or 3 extra frames while recording. 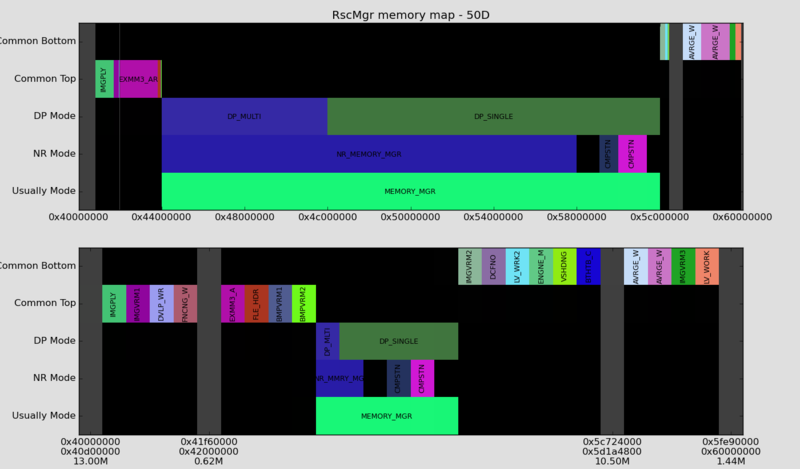 SRM figures are here - looks like there is potential to squeeze a little more memory for raw recording, if the two "AVERAGE_WORK" blocks are unused in LiveView (about 47 MB, which might be noticeable). so Canon code probably assumes IMGPLAY and SS_DEVELOP1 will never be used both at the same time. Sorry guys, mothers day had to come first, but after all the times alex helped me, I will return favor when I can. Looks like we have a 4MB free block. Nice! Looks pretty similar to 50D. I will try to run the test later, but I don't know which value should I put on the sample code that a1ex has posted for 70D. 500D is not included in the list with values that Nikfreak has provided for several cameras. Is the same value of init_memory_pool ? Look for the function that prints strings similar to those in the above logs. I will run the test later. Sorry for the dumb question: which is the file where I have to insert the code for the "Don't click me" test? I have been looking everywhere in ML source tree and I still don't find it ... It's "debug.c" file? 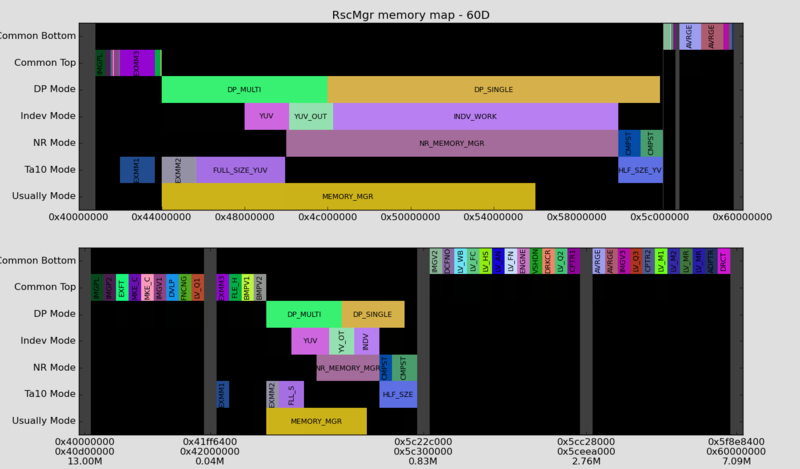 Edit: I found it, is the "run_test()" function in "debug.c"
The good part is that 500D doesn't have issues with the general-purpose memory, so it's fine the way it is. Are the "Low-level allocators" stubs useful for your investigation ? Do you need them for other cameras?. I could search them for 50D or EOS-M.
Could be interesting for 50D, since there appears to be a large free block. The 50D doesn't have memory problems either, so it would be more like future-proofing it. I have found the stubs for 50D. But there is something in this cam that does not happen in 60D and 500D. The stubs for 50D are duplicated, they can be found in two different places, with a fixed offset of 0x800000 (8MB block?). NSTUB(0xFF818CF4, _malloc) // maybe it's better to use Allocate/Free? The functions are identical in both cases.